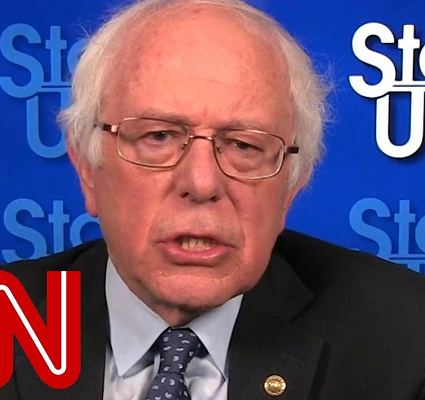 Bernie Sanders has announced he’s taking another crack at the Presidency though there’s nothing remotely hopeful about his chart. 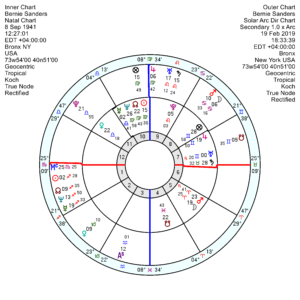 His Virgo Sun in an expansive (overly-confident) square to Jupiter in Gemini is catching tr Neptune hard aspects through this year and next. 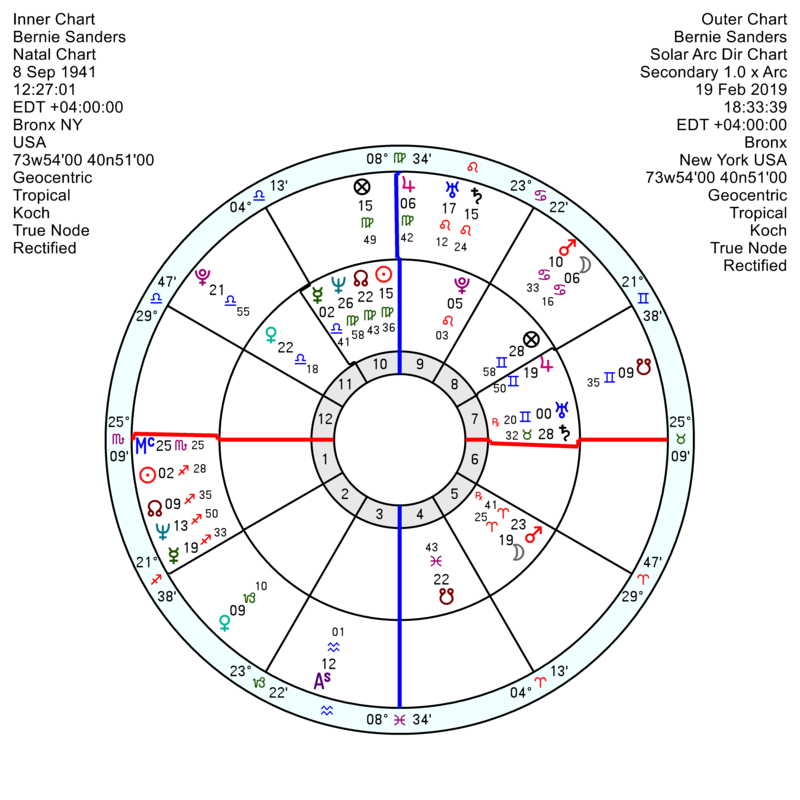 Plus he has a deeply frustrating tr Pluto square his Mars in Aries picking up this April and running on and off till late 2020; made a million times worse by Solar Arc Pluto opposition his Mars which will be on the exact degree from mid 2020 for several months. He’ll feel caged and enraged. See post September 18 2017. I am also a Democrat. Sanders is not a Democrat. He says nice things like medicare for all etc. but these are not his exclusive ideas – other people also have them and it’s not just the younger people. Many believe he is Putin’s replacement for Trump (Oh you don’t like Trump? Let me give you this “progressive” guy). He talks a lot but does not have the record to match it. He is 78 years old and a white guy. We have yet to see HIS tax returns and we have reason to believe he has also been given money from Russia. A lot of people are putting their faith in him hoping that our country can have the things other industrialized countries have such as medical insurance for everyone. The fact is, other candidates can accomplish that and other “socialist” ideas as well. He is not god and he is not right for our country. It’s time for a woman and she is Kamala Harris. Yes! I couldn’t have said it better myself. I too am supporting Kamala Harris. Well said, JW! BS is way too divisive, evasive, and he has a lot of explaining to do. He will be Vetted this time. Right now my candidate is also Kamala. I like the way she carries herself and what she has to say. Chris, I’m also a Democrat, and also favor Amy Klobuchar and Kamala Harris, though I’d vote for Joe Biden in hopes that he would attract centrists from both parties and take the presidency from Trump. I have to point out, though, that the “Superdelegate” card-stacking in preparation for a coronation of Hillary Clinton last time around justifiably enraged Democratic Progressives. It wasn’t a fair fight, or anywhere near it. Moreover, Clinton’s dealings with the Wall Street fat cats who personally enriched her with hugely inflated “speaking fees” left a bad taste in the mouths of many. I’d point out, too, the many positions Bernie pioneered, such as Medicare for all and tuition-free (NOT fee-free) state college, that a majority of the New Democratic candidates have appropriated. He did speak specifically about how to fund the programs. And as a baby-boomer recipient of almost-free tuition at an oil state university, I paid $100 per semester when the big oil companies paid severance taxes to my state. That money went straight to higher education. These days, students at my alma mater are taking out loans in excess of $40,000 a year…but the oil companies aren’t paying a dime. It’s not brain surgery to plan how to expand benefits to ordinary Americans, and Sanders deserves some credit for reminding us of that. Hillary Clinton won the primaries because more people voted for her. I’m one of those people. Sanders supporters go on and on about how “unfair” the primaries were….but they seem to forget, the same rules were put into place back in 2008. In 2008, Hillary Clinton would have been the nominee had the votes in Michigan and Florida (my state) had been counted. Hillary won those two states. She also won the popular vote in 2008 (it was very close, but she still won). The way she lost in 2008 was because Obama received more pledged delegates….and he also received many of Hillary’s super-delegates (who are allowed to switch sides if they want to). As a Hillary Clinton supporter in 2008, I was furious with the Democratic Party (and the media) for implementing such rules to block her from getting the nomination. However, I finally accepted that it was what it was…and Hillary agreed to those rules too. President Obama went on to be one of my favorite presidents. In 2016, I supported Hillary Clinton again. And, like in 2008, the same rules were in place. However, things were different that time around. Hillary Clinton won the popular vote by almost 4 million over Bernie Sanders. She also received more pledged-delegates. She won most states and all 6 territorial caucuses / primaries (D.C., American Samoa, Guam. Northern Mariana Islands, Puerto Rico, and U.S. Virgin Islands). Sanders supporters claimed it was “fraud” and they went on and on about how much they thought the super delegates were. However, they fail to realize that even without super-delegates, Hillary Clinton STILL won the nomination because she won more contests and more pledged delegates. Then, Sanders people went on about how “unfair” “closed primaries” were (even though Sanders benefited from caucuses which we Hillary people could have argued was equally “unfair). Again, Hillary Clinton did win most “closed primaries” but she didn’t win ALL of them. Oregon was a “closed primary” but Sanders won by a very significant margin. Also, most Southern states were “open primaries” and anyone could have voted in them…..Hillary still won every Southern state except West Virginia. The bottom line is: it came down to demographics….not “closed primaries” or “super-delegates” Hillary Clinton’s strongest base were African-American women (who are the backbone of the Democratic Party), White women over the age of 35, and Latina/Latino voters. Hillary was also able to split the White vote. Sanders’s strongest base were White Millennial voters (who are not the majority in the Democratic party)….so, he didn’t when the groups he needed in order to secure the nomination. I’m a Democrat and I absolutely cannot stand Bernie Sanders and his cult-like supporters. In fact, Bernie Sanders and Tulsi Gabbard are the only two candidates on the Democratic side who I have animosity towards. I don’t have a problem with any of the other Democratic candidates running. So, reading this post makes me feel so much better. Sanders is too polarizing and he has such an obnoxious personality. On top of everything else, he makes promises that are impossible to keep. He’s never been able to explain how he would implement his ideas and proposals – and that should be a red flag to his idealistic supporters. Kamala Harris and Amy Klobuchar are my two favorite candidates running this year; I hope they continue to galvanize support. I’m glad Elizabeth Warren and even Tulsi Gabbard are running though; they’ll both take some votes away from Bernie Sanders in the primaries (I know a few former Sanders supporters who are now supporting Warren or Gabbard this time around) and that should be enough to keep Sanders from getting the nomination. He is 79. He still isn’t member of Democratic Party. He is running against true Progressive Democrats, such as Elizabeth Warren this time. But most importantly, Trump has changed the political landscape. 2018 midterms saw a record participation to Democratic Primaries. The trend will continue, as more Independents (and even some Republicans, this is still a small movement, but I’ve seen opinion leaders especially with Military background flipping, and think there will be a bigger shift among Military voters than thought) register as Democrats in States where this is required. This will likely steer the race towards Center. Majority of Democrats are indeed centre-left (like myself). Kamala Harris and Amy Klobuchar are my top two favorite candidates. However, I have no problem with very progressive candidates like Elizabeth Warren – I just don’t think someone as far to the left as Warren will win the general election next November. I live in Florida…this is NOT a progressive state by any stretch. The only Democrats who win in this state are the ones who are more conservative or at least centre-left. And….Democrats still need Florida; we have 29 electoral votes.